"The most notable positive picture quality features of the P-series 4K LED are the full array LED backlighing"
The Vizio P602ui-B3 is a value oriented 60 inch 4K LED TV that we were eagerly awaiting nearly the whole of 2014. The price for 4K technology sure is coming down quickly in 2015. Pricing for this new Vizio offering looked to be a gamechanger for this year, however performance isnt as robust as we initially thought it would be. The P-series Vizio 4K LED TV is produced in 5 popular sizes. The TV is packed with all sorts of picture quality features like full array local dimming with 64 zones, Ultra HD upscaling, and a 960 Clear Action Rate for fast motion processing. Top it off with updated Smart TV features and you have a worthy 4K contender. There is a lot to discuss in picture quality. There are not a plethora of options out there for 4K content and this makes testing and evaluation more difficult. This means that upscaling to the native 4K resolution of the panel takes on significant importance in our evaluation since most everything you will currently watch (1080p HD, 720p HD, 480p/i standard def) will have to be up-scaled – putting pressure on processing engine and software performance. For this reason, we choose to render the picture quality rating and notes based on those lower signals rather than 4K. This is the most important aspect of 4K UHD TVs. Vizio gets a passing grade but nothing more as the TVs Sharpness is too much even after picture setting adjustment. Call the processing in the P-series Vizio hyperactive if you will. Light flow through from on screen lights can be too much. Detail and edge enhancement ditto. No matter whether the signal is 4K or 1080p, the picture is over-amped. If you are the type of person that prefers the preset picture setting on the Vivid mode or the Dynamic mode, then this might be the perfect TV for you. The most notable positive picture quality features of the P-series 4K LED are the full array LED backlighting (as opposed to edge lit LED backlighting) with 64 active zones of local dimming. These have a direct effect on contrast, peak whites, and deep blacks and we were pleased with the results. Blacks are inky and contrast is impressive. The 64 employed zones are double that of the M-series HD LED by Vizio. A 960 Clear Action Rate is Vizio's backlight scanning feature that amps up the native resolution of the screen for better fast action performance. There are times when this is helpful, but it shouldn't always be enabled. The Pure Pixel Processing Engine is another welcome addition that reduces noise and improves picture quality from a compressed source. 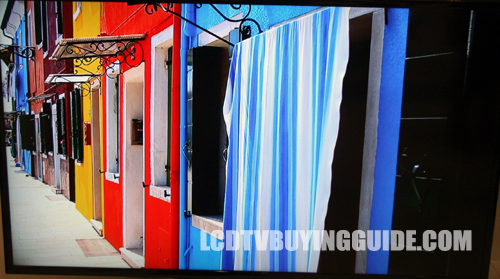 As usual with all LED backlit LCD TVs, the P-series Vizio is no exception that contrast and coloration degrade at side angles. The screen is not curved to try to diminish this effect as are some of Samsungs. By our best estimation, contrast begins to degrade at around 30 degrees off center. One of the greatest traits of local array LED backlit TVs is the beautiful lighting effects from on-screen windows and on-screen in room lights. It can add a neat visual effect and make programming more 3-dimensional. My only problem with the P-series Vizio is that it sometimes overdoes it. The on-screen image lighting can be extreme enough to cause the picture to look less realistic, basically diminishing natural background blur. The good news about this is that it did not often bleed over in any way on shadows. When watching a couple of darker scenes from Netflix's House of Cards in 4K we did note some uneven backlight (contrast) performance. We mentioned before that there are 64 separate backlight zones in the P-series Vizio. We recommend leaving the local dimming setting on for enhanced contrast and black levels. Performance here was very good as this can be such a detractor with LED backlighting. This category of performance often changes over time but at the time we tested the P-series, we noted a bit more light coming from the center of the screen which makes sense since it has full array LED backlighting rather than edge lit. I thought color rendition was very good on the P-series post calibration, while certainly less realistic than our highest picture rated Sony 4K X950B series. It does not present any better nor worse than the M-series by Vizio. Greens can sometimes be a bit unrealistic looking. Picture Settings: In addition to the already pretty complete menu options on the M-series Vizio, the P-series also gives you the ability to turn the local dimming feature off if you so desire. There is a 10-point grayscale and gamma preset control as well to enhance calibration. Overall, it's a very complete menu of settings and with more preset Picture Modes than most competitors. We recommend turning off these two picture settings especially for movies and normal TV programming due to the unwelcome effects they produce in reducing natural background blur in scenes. It creates an artificial kitchy cutout effect and is not the way the original producers meant for the programming to be viewed. Turning these features off does cut down on how detailed and refined image edges are, so be prepared for that. Leave it on for sports and super fast action to cut down motion blur and create a more 3 dimensional image. 802.11ac dual-band MIMO wireless is built right into the TV for the fastest connection available. This really helps when streaming HD content, and hopefully 4K content soon. The Vizio P series pushes the updated Smart TV platform, Vizio Internets Apps Plus. This provides all the apps you'll need for streaming video and music. One of the best upgrades is the processing power behind it all. The V6 processor provides a quad-core GPU and a dual-core CPU. This should handle all the video and computing that you'll need on a smart TV. Second screen interactivity from your smartphone is another big plus here as well. The Via Plus Apps and Internet options are complete enough an the system allows you to organize the icon choices to create a more user friendly platform. This allows you to avoid the Apps you dont want. The Netflix App allows 4K UHD streaming in the P-series, although at the time of writing it did not have the same for Amazon Instant. The options are plentiful with all the main movie and TV Apps and sound Apps like Pandora, Spotify. Not that I like them much, but there is a lack sports Apps. 4K streaming is possible with the HEVC H.265 codec and the latest HDMI standard for full resolution 60fps playback. HDCP 2.2 also allows for playback of copyright protected 4K content. 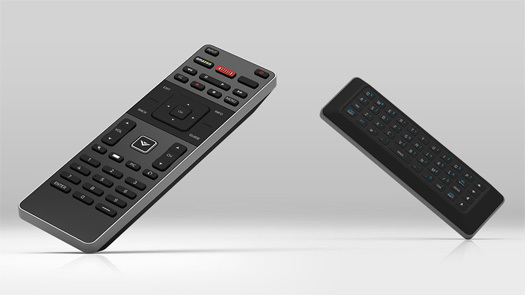 The buttons on the standard remote are too small in many cases and operation is not smooth. 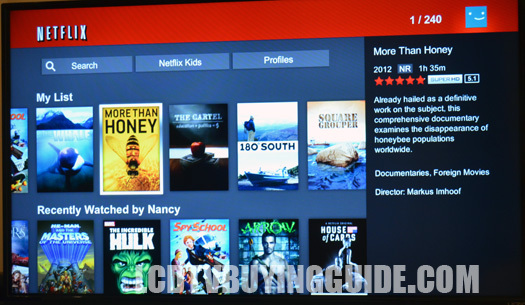 There are dedicated Smart TV buttons for Netflix, M Go, and Amazon allowing quick access to those Apps. The front side is not backlit but the more helpful QWERTY keyboard remote on the back is. The QWERTY side of the remote really helps speed any kind of search. The P-series Vizio is an excellent gaming model with a Game picture mode but also a Game Low Latency setting that helps reduce input lag no matter what Picture Mode you are using. The TV has incredibly low input lag in the Game Mode and we do not hesitate to recommend this model as a gaming TV. It's always nice to have more HDMI ports. 4 of these are normal 1080p, 4K (30Hz) ports, while the 5th is 2.0 for 4K (60Hz) or a PC at 1080p(60hz). The P602ui has is very similar in design to the M series from last year. The biggest difference is the color of the finish. The P series features a dark metallic finish on the sides of the bezel. The ultra slim 8mm black bezel that surrounds the edge to edge glass of the screen is fantastic. The base and neck are made out of metal to give it a solid construction and feel. 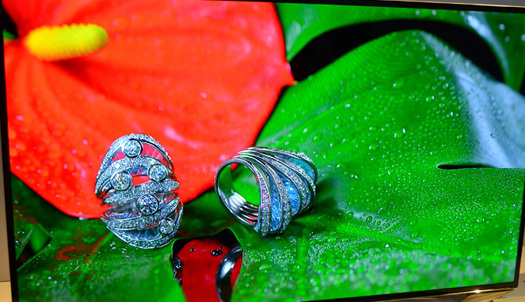 The profile is razor thin and competes with the best LED TVs on the market. It's not nearly as flashy as the other 4K TVs on the market, but that may not be a bad thing for those who want a traditional looking TV. "My only problem with the P-series Vizio is that it sometimes overdoes it. The on-screen image lighting can be extreme enough to cause the picture to look less realistic"
With the price now just above the M-series Vizio, why not spring for the P-series. Actually, the M-series may deliver you a preferred 1080p HD picture rather the the over-processed on on the P-series 4K TV especially given the dearth of 4K content. 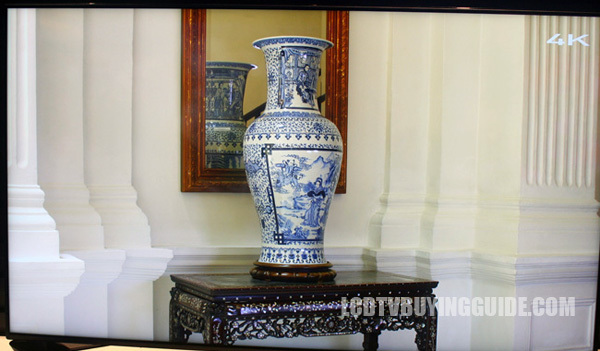 If you were wondering whether the up-scaling conversion of Vizio would be sufficient with HD signals, wonder no more, Vizio has even overdone it and could not avoid visual artifacts in the the process. Nevertheless, we have to give the P-series Vizio an exceptional Value Rating with prices this reasonable. The P602ui-B3 sells for just $1500. Granted it does not compare in quality with our favorite picture on the X950B Sony, but neither does the price.